Christmas is that time of the year when everything seems to have an aura of magic. The decorations, gifts, Christmas stories, the carols, iced cookies and feasts only enhance that feeling. A bit of advance preparation and decorating can make the house a warm cosy space to spend the holidays. Lights play an important role here. It’s not just the main living areas that demand a bit of sprucing up – even bedrooms can be decorated for this season. Children’s bedrooms especially can look forward to a delightful makeover. Fairy lights or string lights are the easiest way to invite the Christmas spirit into your child’s room. Arrange strings of it over a wall or over curtain rods to make things more festive. Intersperse it with Christmas ornaments and wreaths too. However, don’t end your lighting game with fairy lights alone. 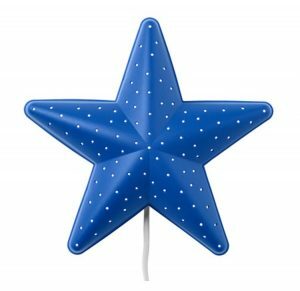 A star shaped wall light uses the famous symbol associated with this season to jazz up any room. Arrange more than one star light to make things interesting. Alternatively, bring in the symbol of love with a heart shaped wall light and take advantage of the white and red Christmas theme by mixing it with elements such as a white snowman or Santa figurine, peppermint sticks and fairy lights. Use LED lighting boxes to your advantage by arranging the nativity play or Christmas themed figurines in different boxes and stacking them up for an interesting installation. You can use the holidays as an excuse to revamp your child’s room and make some decorating changes. Remove old light fittings and replace it with beautiful fixtures such as a delicate pendant lamp, cute night lights in the form of animals or a decorative light chain to bring alive a boring old corner of the room. There’s no rule that says you can’t gift lighting products. A disco ball would be much appreciated by a budding dancer or DJ. It’d be great for birthday parties too. A spot light on the other hand would be appreciated by kids who’re into theatre or just about any child who’d love a bit of drama in their room.